(Left) Amy Oxley at 25 years old. (Right) Some early students at the Blind Boys School in Deng Doi, c. 1899. When Amy Oxley left Australia for her long journey to China in 1895, she was 27 years old and single. In the lead up to her travels, news had broken of Australian missionaries brutally murdered in places close to where she was heading. And yet, she went. 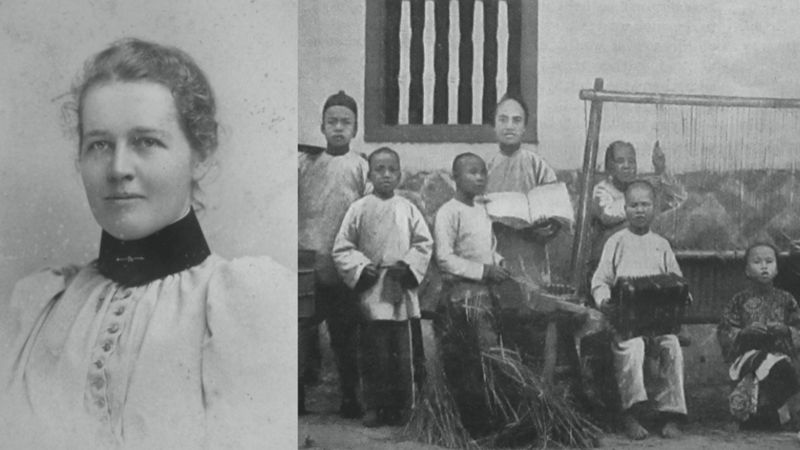 It is this courage, grounded in God, that made Amy Oxley Wilkinson one of Australia’s most inspiring missionaries, and now the subject of a new book, They Shall See His Face: The Story of Amy Oxley Wilkinson and her Visionary Blind School in China. Amy intended to work as a nurse and missionary, but she soon found herself called to work among blind children. Within five years, she had fully devoted herself to the Blind Boys School in Fuzhou, in southeastern China’s Fujian province, that she founded in 1898. Amy was aware that Chinese children had a greater tendency to contract blindness. Amy was aware that Chinese children had a greater tendency to contract blindness. This was brought about by a number of factors such as vitamin A deficiency, trachoma, glaucoma, congenital cataracts, accidents and measles. Lack of adequate medical treatment escalated the problem. Around the same time, Amy was evacuated to a different region to escape a typhoon and, while there, she visited a School for the Blind run by an English missionary and was introduced to English Braille. 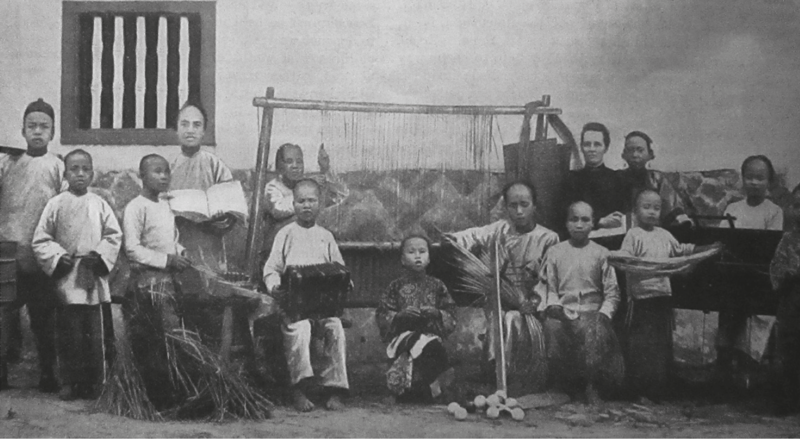 When she returned to Fuzhou in late 1898, Amy rented a small house, hired a cook and opened her own School for the Blind. She had translated Romans and the Psalms from the Fuzhou dialect into Braille, which was then printed by the British and Foreign Bible Society. Although Amy started the school with only one student, within six months there were 15 students enrolled, with room for no more. By mid-1900, it was decided to expand the school to accommodate 100 boys. The school was constructed with funds raised in Australia, and with the help of a new missionary doctor from England, George Wilkinson. Amy wanted the school to reflect Chinese architectural styles, so she insisted it have an attractive, curved, pagoda-style roof. It was large enough for the blind boys to live, learn and work in. Over the years that Amy worked with the blind, a picture that kept coming into her mind of heaven as a place where everything would be fully restored, one in which crying, illness and pain would be no more. She often talked to the boys about this. After much reflection, she decided on a name for the new home for the blind boys – in spoken English, ‘The Soul-Lighted School’. Inscribed above its entrance were the words ‘They Shall See His Face’ – a quote from Revelation 22:4. After the school was finished, Amy and George were married. George continued his work as doctor, and Amy served as principal (or ‘Auntie Teacher’) of the Blind School. Under Amy’s leadership, the school grew and gained popularity in the surrounding districts. In 1920, Amy was honoured with the Order of the Golden Grain, a special medal for good works. It was the highest honour that could be conferred in China on a foreigner, and it had been awarded to a Westerner only once before. They Shall See His Face: The Story of Amy Oxley Wilkinson, written by Linda and Robert Banks, is published by Acorn Press. After an initially fruitless search for any trace of the Oxley family in the United Kingdom, authors Linda and Robert Banks eventually tracked down Amy’s great-granddaughter, Ruth Oxley Horne. The ‘Oxley’ in Ruth’s surname is a nod to her grandmother, Amy’s daughter Isabel Oxley Wilkinson. For the Banks, Ruth Osley Horne proved to be a vital piece in the puzzle of the Oxley family. According to Linda, they knew they were on the right track when they found a photograph of Ruth on the internet and saw a family resemblance to her great-grandfather, George Wilkinson. Ruth was able to give them information about Amy and George’s work as well as their family life in the United Kingdom, much of which fills the later chapters of They Shall See His Face. Along with plenty of family anecdotes about Amy told to her by her father, Ruth had some important memorabilia in her collection. These included the Order of the Golden Grain medal awarded to Amy by the Chinese government in recognition of her work at the Blind School.